11/5/18 - My clients Ken an Mike first time Klamath Fly fishers had blast, yesterday, hooking up on fish like these, some smaller and some bigger but awesome action all day! 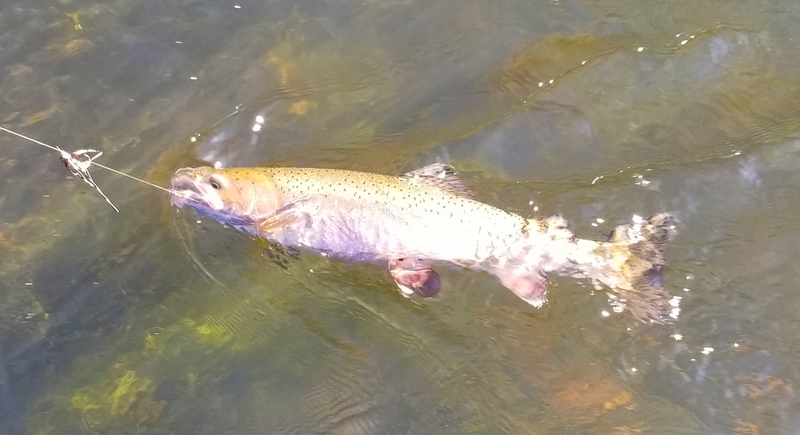 The Klamath bite has been awesome with action all day long. The hottest method right now is on the fly rod with an indicator. Rubber legged stones and egg patterns are pretty much all one needs to catch fish. Salmon are still spawning creating lots of food in the river. Conventional gear will catch fish as well back trolling and casting plugs is one of my favorite methods and will only get better as we move into winter. Fish size will vary from day to day. Typically from here forward one could expect to catch fish in the 8 to 30 inch range with 16 to 25 inch being the most common size. Weight of these fish can vary greatly, often seeing fish under 20 inches but fat as footballs weighing 3 to 4 pounds. The poundage will often be between 1 and 10 pounds with 3 to 6 pounds being the most common size during the winter. The Holidays are a fantastic time to fish the Klamath, and the November weather is awesome right now. I also have gift certificates for Christmas they make perfect stocking stuffers too!